This spring, I did this experiment to get back into the studio. I had just taught a two-week art residency and gotten a bunch of things stolen from my car (including a lot of my artwork and supplies). I was upset and a bit exhausted and I needed a fun way to get back to my work routine. I pulled out some small Masonite panels and set about to create a little collage series. I don’t work with collage very often and had no expectations or plans with them. I was just playing around. I ended up sharing these and I had some big revelations working with maps, geometric shapes, and drawings on transparent rice paper. This fall I got into a bit of a funk. I’m not sure where it came from. I had a good work routine and I was happy to be home, but I wasn’t really getting much done. It happens. Something that helped to get me through this, and most importantly, allowed me to keep painting and drawing, was creative play. I had to free up my mindset so that I wasn’t so worried about the end product. I started a series of portraits. I barely ever paint people so this was a big challenge for me, and because it was a challenge, I didn’t expect to create much of worth, or for it to go anywhere. But I was having fun. I watched a class on Creativebug (see below) to get some inspiration and started there. Now I’ve done about 30 portraits and I know it’s something that I know I can sit down and do for 20-30 minutes, practice drawing, and it will help my art practice grow. In this series I started using acrylic ink, which has led to a breakthrough in my other work. 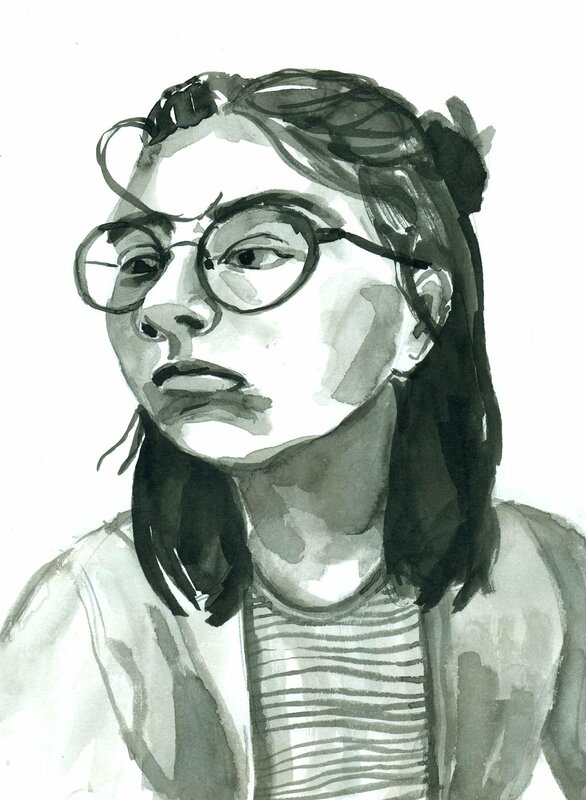 Above - Two ink portraits I made using the Sktchy Ap for image sources. Again, this fall when I was feeling unproductive and stuck, one thing that got me inspired was getting a subscription to Creativebug and watching other people make art. If I was feeling really stuck, I could follow the lesson exactly, and if I was feeling more creative, I could take the lesson my own direction. When you sign up, you get a free month subscription, so you can’t really loose. I love that a lot of their classes are short, daily activities, and often take 10-20 minutes, so they are perfect for setting up creative play exercises. Scrolling through the lessons I found Charlotte Hamilton’s class on portraits. I thought “I rarely draw people and I’m not very good at it, so I should give that a try”. It ended up sparking this whole new series of play for me. On a side-note I also love to teach, so watching other people teach and put together lessons is full of inspiration. There are an endless number of affordable sources for watching people make art online. Creativebug is one. Creativelive screens live classes for free (the also sell them). Skillshare also has a trial period of two months for $0.99. And then there is YouTube…Find what inspires you. When all else fails I think just putting something on paper can help. I’ve really been enjoying making weekly entries into my perpetual sketchbook about the natural world around me. It helps to have an ongoing journal and project. However, it doesn’t have to be that complex. You can draw a series of lines on paper or mix color swatches. Sometimes this can be a playful warm up which leads other places. Or maybe that’s all you do in a day, and that is fine too. Top: Two entries in my perpetual sketchbook. Bottom: Just making lines, shapes, washes, and color swatches with watercolor. I’m curious, do you implement creative play and what does it look like for you? Note - I don’t make money off of this blog. I just share resources that I’ve found useful in hopes they are useful to you as well.